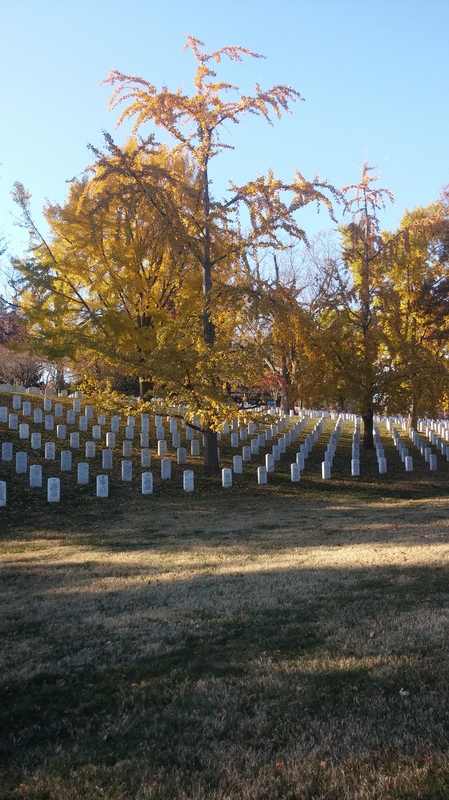 Today I took a walk with a friend to the Arlington National Cemetery before writing. I was still shocked that so many leaves were still on the trees. When I went home to New Jersey for Thanksgiving, all the leaves had fallen off. So I was able to take some pretty nice pictures on the walk. I will post them below. We also stopped at the Tomb of the Unknown Soldier and was able to see the changing of the guard ceremony. This is something I haven’t done since our 8th grade DC trip back in middle school. It was a great day for it. After I was able to get a good amount of writing done. 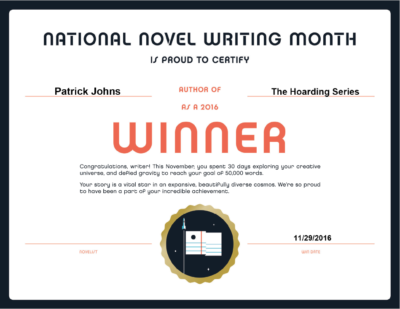 I am currently wrapping up the ending (a little worried that I will finish before 50,000). But I am sure I will be fine. Less than 3,000 words to go! I have also decided to release a sample chapter of my new book at the end of NaNoWriMo so keep an eye out for that! 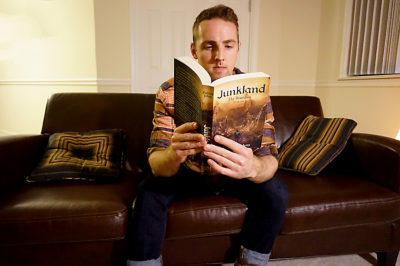 It is Sunday and as promised I posted the next chapter of my first book, Junkland, below. Check it out and let me know what you think! Fun Pat Fact: This was probably one of the hardest chapters to write for me. THEY HAD TO CUT their fishing short after Kevin said he didn’t feel well. Shortly after Kevin’s random outburst, he had vomited in the lake. So Jahrys rowed them back to shore. He kept insisting that he would help him back to his grandmother’s house but he refused. He apologized for ruining the trip and quickly took off up the road without him. Jahrys was mostly disappointed because he had to go home early and help his father prepare for the night. That’s where he was at that exact moment: his father’s shop. The shop was located far up on Zalus Road, by the castle gate. It was past the church, past the Arcalane, and past all the courtyards and squares. It was a good location for the castle folk who were the ones willing to spend the most amount of money. It was a tiny shop. There was a little counter that hugged a corner by the entrance door. On one wall, wine bottles were stacked in little shelves. On the other side, wooden chairs, beds, dressers, desks, and other things his father had made were lined up. Tags were wrapped around each one to indicate who they were made for so it was easy to figure out when the customer arrived. There had been a rush of people about an hour ago. The line had wrapped around the store. It wasn’t carpentry work they were ordering or picking up. They were all interested in wine. But as the sun began to set behind the Western Mountains, the amount of people entering the store lessened. The wedding had ended and the festivities have begun. Everyone was out in the streets getting drunk and making poor decisions. Jahrys was stuck behind the counter. He was sitting on a hard wooden chair, leaning back while he crossed his feet and rested them on the countertop. His father was in the back room, working on a few orders. To pass the time, Jahrys was reading a rather thick book called, The Knightly Tales and Heroic Adventures of Patrik Yale. Patrik Yale had lived and served in the years of the first king: King Danor Poole. Jahrys was reading the tale of how Patrik had received his knighthood. His parents had died when he was really young. 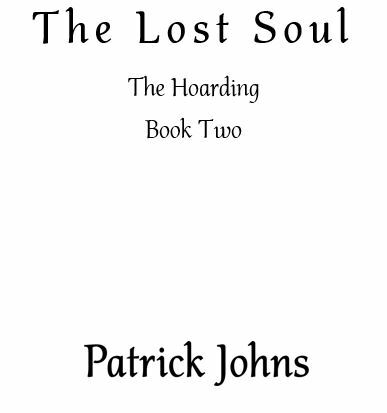 The only thing Patrik had owned were the clothes he wore on his back and a lute that once belonged to his father. He would practice the lute day and night, listening to songs he heard on the streets and trying his best to mimic them. Once he was decent enough. He began to perform in public, making a few pooles here and there; enough to live off of. One day, King Danor had been traveling the streets of Astenpoole. He came across Patrik who was playing his lute in front of a small crowd on Poole’s Road. The king had been very impressed by the boy’s skills. He had approached the boy and asked him if he would play for him in the castle keep. In exchange he would provide the boy a place to sleep in the Princess’ Tower with food to eat. Patrik of course did not hesitate to turn down this offer. He had never thought he would ever play for the King of Astenpoole. So he spent his days living and playing for the king. He would play while King Danor ate, while he thought, and even while he slept. And he even got to play at some royal parties. But most importantly he was able to play freely in the courtyards for the common folk. Who Patrik really enjoyed playing for was Princess Melaine. She was the same age as Patrik and a beauty. Patrik had described her as prettier than any sunset setting behind the Western Mountains. More beautiful than the pink and orange clouds that would swirl in circles around the sky. Prettier than the millions of diamonds that would sparkle off the Farrest Sea. He was in love with her. One dark humid night, while the castle was sound asleep, pirates rowed to the sandy beaches of the shore. They had found a way inside the castle, into the castle keep, and snuck their way into the Princess’ Tower. No one heard them enter and no one heard them leave; except for Patrik. He had heard struggling outside of his window that night. He looked out and saw the pirates carrying an unconscious girl across the courtyard; it was the princess. Patrik lifted his mattress and picked up the sword he kept hidden underneath it. The one that he had stolen from the armory so he could practice in his spare time. He sprinted down the steps, burst open the doors that lead to the courtyard. He ran the pirates down. There were three of them. Some say he killed all three with a single stroke of his sword. Other tales say it was a single stroke per pirate. But it didn’t matter. Patrik Yale killed the pirates and saved the princess. The entire castle had woken up at that point to discover this new hero. The king had rewarded Patrik Yale with his knighthood the very next day. “Call me Jahrys! And they aren’t fantasies! These are real stories about a real hero,” he said, irritated at his father for not understanding. “Ha! If you want a real hero, you should read this.” His father walked behind the counter and pulled out a drawer. 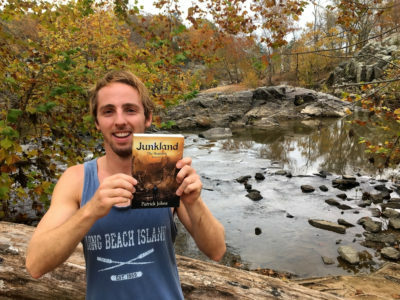 He handed his son a book. “The man knows his stuff I tell you. The man knows his stuff.” His father pointed a finger at Jahr like he was teaching him a lesson. Jahrys bobbed his head, not wanting to hear what he had to say. “And what happened?” Jahrys asked curiously. Jahrys’ head dropped again in disappointment. Jahrys looked up, surprised at this sudden change. There was an awkward silence. Jahrys had never heard his father speak like this before. “Yes. Go home and check on your mother.” He gave his son a pat on the back. Jahrys walked down Zalus Road towards his house at the very end. People were busily packing up their tents or closing up the shops for the day, eager to join in the celebrations. Jahr passed stages where musicians began to tune their instruments, people already zigzagging drunkenly across the streets, and the Arcalane which was crowded with people inside and out. People were sitting at tables on a nice wooden deck. Music sporadically changed volumes as the door to the bar opened and closed. Jahr spotted Kevin who was working for Bartender Willy that night. He was pushing his way through the crowd to the entrance of the bar. He wanted to ask if he was doing alright but he looked busy as he opened the door to enter. As the door opened again, Jahrys could hear Willy’s voice booming over the crowd. He crashed through the door, holding two people by the backs of their shirts. He threw them out into the dirt road. “If ya want to act like animals, you do it out here. Not in my bar. Be gone with ya!” He shooed them away with a hand. The two men struggled to find their feet and scurried away in different directions. “Oh hey Jahrys!” Willy waved across the street. “Be careful tonight! The streets be filled with drunken idiots.” He waved again and turned back into his bar. Jahrys continued towards his home. He was passing one of the first of many courtyard squares in Palor. There was a life size statue of Zalus in the center who was holding his palms up to the sky. Small trees surrounded it with a few benches here and there. Shops and tents surrounded the perimeter. It was crowded. The people here were just starting to pack up their things for the day. He suddenly heard yelling. He turned his head around, searching for the source. Not again, thought Jahrys, when he found the source of the commotion. Hugo was holding a girl’s hand up in the air, screaming at her. The big oaf always accused people of stealing from him. Maybe that was why his business was doing so poorly. But I—” the girl began. Jahrys watched Hugo take out a long knife while slamming the girl’s skinny arm onto the table. I have to do something! Jahr saw a decent sized rock and picked it up. He aimed and threw it. He sprinted as fast as he could towards the girl. “Argh! What was that?” Hugo turned, taking his hand off the girl to rub the back of his head. Jahrys used this distraction. He grabbed the girl’s arm. “Get off of me!” She yelled. Jahr tried his best not to sound like an enemy. “Shhhh, grab my hand, I will get you out of here.” She gave in, giving him her soft hand. They sprinted down a side road. Hugo and his men chased after them. Jahrys tightened his grip around the girl’s soft hand. They changed direction multiple times. First going left. Then right. Then left again. And another right. They finally took one last left and popped out into an open alleyway that was filled with people. Without thinking, Jahrys flung the girl up against the wall. They both stood silently waiting. Jahrys felt the girl’s small breasts touching his chest. He felt the warm heat of her breath against his neck. She smelled sweet of roses and berries. Her brown hair tangled down and brushed his hand that was behind her back. It felt smooth and soft. He suddenly felt movement at the bottom of his shorts. His face had reddened. He tried to control it but it was no use. He only hoped she didn’t notice. Their eyes traveled down to the object that was still in the girl’s hand. It was a doll. They both started laughing. They laughed and laughed and laughed. The girl was laughing so hard that tears started to roll down her cheeks. Jahr liked that. He took her through another maze of alleyways. He was nervous but tried to act like he had a plan. But really he didn’t have a plan. He had just saved a beautiful girl from getting her hand chopped off by Hugo. What now? What would Patrik Yale do? They didn’t mention what happened to him and Princess Melaine after he had saved her from the pirates. He decided to take a right at the corner. They broke out of the maze and came upon a small river that was flowing towards the castle. Balconies from the apartments lined the open alleyway and branched out over the stream. The moon was shining high above the mountains. This will be perfect, Jahrys thought. They broke apart and turned to look at the scenery. “This is beautiful,” the girl said, letting go of Jahr’s hand and looking up at the scenery. Her dress twirling with her. “Do all the ladies speak like you in High Pont?” he gave her a playful smile. “The what?” the girl looked oddly confused. “Oh, yes, the manor! I have seen the manor.” The girl gave him an awkward smile but still she looked beautiful. “Your father isn’t Lord Ize by chance?” Jahrys’ hopes were high that this was perhaps his daughter. “I still did not get your name?” the girl asked. “My father named me O’Jahrys after my Grandfather. But I prefer to be called Jahrys, or Jahr, for short.” He bowed to her as an introduction. He regretted it shortly after. “It’s a pleasure to meet you…Jahrys.” Jahr noticed her face gradually redden as she said his name. “Bellsworth. My name is Lily Bellsworth.” She gave him a little curtsy with her dress. “So Miss Bellsworth. What brings you all the way to Palor?” he chuckled. “Not as much as the Poole’s Road, from what I’ve heard,” said Jahrys. The girl’s eyes lit up when he said that. “Yea. I’ve heard that too,” she said. “I am guessing people from Izak do not know never to steal from Hugo?” he asked jokingly. “Oh yea? Then what is that still in your hand?” Jahrys pointed a finger at her closed hand. Lily blushed, opening up her hand to reveal the doll. “You really don’t have great taste in shopping I see,” Jahrys teased. Jahrys felt like an idiot for insulting her. “Thank you for saving me Jahrys but I really must be going now. My father needs me.” She turned, about to head back towards the main road. He didn’t know why he blurted it out. He didn’t know what he was going to say or do. He just didn’t want her to leave. Not yet. Jahr’s eyes quickly wandered around. He spotted a boat in the small river. He walked over to it, placing one leg inside and one still on the road. He offered out his hand to her again. “Will you trust me one more time?” He stood there for what seemed like an hour. He must have looked like a complete fool. He held his composure during the long silence. Lily finally walked over. She placed the doll in her pocket of her dress and accepted Jahr’s hand. She smiled at him. Her white teeth glistened in the moon light. Jahrys helped her into the boat. “Now if you thought that was beautiful, wait until you see this.” He made sure she was comfortable and then readied the small sail. There was a light gust of wind on the river that would be enough to take them upstream. Jahrys creeped a glance over at Lily while he was unrolling the sail. Her brown hair blew in the wind behind her. It was breathtaking. The wind caught the sail and the boat took off. Jahrys sat in the back of the boat, steering, while Lily sat below in the base. She was looking up at all the balconies that lined the river above them. Jahrys was happy she was enjoying it. After a short while of sailing, the river began to open up. Zalus’ Tears was roaring not too far off in the distance across the lake. It almost sounded like a stampede of buffalo. Jahrys steered them towards the center. Jahrys slid down to the base of the boat, sitting next to Lily. She smiled shyly at him as their shoulders brushed together. “If you lie back you can see all the stars,” he said, nervously. They both lied back and gazed up at the clear night sky. The moon was shining bright. Millions of stars surrounded the perimeter of the mountains. They looked like diamond clouds that swirled in spirals around their heads as the boat lightly spun in the water. Crickets were chirping off in the distance. A frog was croaking somewhere on shore. “It makes you feel small, doesn’t it?” Jahrys placed his hands on his stomach. “What does?” Lily asked, confused at what he was referring to. “Which one would you travel to?” Lily asked teasingly, turning her head towards him. Jahrys looked up and thought for a minute. They all looked exactly the same. “Hmmmmm. I think I would pick that one.” He pointed as best he could to the star he chose. “And why did you pick that one?” she asked, curiously. “Those are wise word, O’Jahrys,” she giggled at him. He cringed at the sound of his name but ended up laughing with her. “Yea…they are wise words,” he said more to himself. “Okay, your turn. Which star would you travel to?” he asked. “Hmmmmm. I would pick…that one!” she pointed up towards the sky. “Which one?” Jahrys couldn’t see which one she was pointing to. “That one! Way up there,” she dragged his finger as best she could to the star she had picked. “I’ll run away with you,” he said. Jahr rose up and leaned over Lily, staring deep into her eyes. His heart was racing in his chest. He had never felt anything like this before. His stomach felt like it was twisted in a hundred knots. He wanted to kiss her. But he was afraid to. He didn’t want her to freak out. They both silently looked at each other for a long time. Catching him off guard, Lily lifted her head and kissed him lightly on the lips. Her lips were warm, smooth, and wet. It was his first kiss. She backed away, leaving Jahr with a surprised look on his face. She giggled at that. Jahr felt his face turn red. He then felt her fingers start to run through the hair on the back of his head. It felt tingly and soothing. Jahrys stared back down at Lily. She gave him a serious, innocent look. He leaned down and kissed her. It was a little more aggressive than last time. Their lips moved in ways Jahr thought wasn’t possible. He felt her tongue brushing his. Her teeth lightly grazing his lower lip. He reciprocated and he could tell she liked it by her body movement and loud breathing. She leaned over and breathed into his ear and gently nibbled on it. At first he was a bit disgusted by that. But the shivers that were sent running down his spine made him want more. They finally sat up, looking around at the view. The castle was lit up, sitting on top of its high hill. The mountain loomed over from behind them. “I’ve never seen the castle this way before. It’s beautiful,” Lily said. “Not as beautiful as you though,” Jahr smiled at her. Lily shot him a look. She returned the smile and jumped on him again. They eventually paddled back to shore. They left the boat and took the path back to Palor. Jahrys pointed out his house on the side. “This is where I live,” he told her. The doll slipped out of her pocket. She didn’t turn around to pick it up. “Wait! Where are you going? Will I see you again?” he desperately yelled out to her. He was confused. What did he do? What did he say? She yelled back. “Meet me at the beginning of Zalus Road three days from when we met!” She ran into the darkness. Jahrys walked over to the doll and picked it up. He examined it. Lily’s mother must have been a pretty woman. The doll was made from thin pieces of tree bark and yellow thread for the hair. It had a small little blue dress on. He held it while staring back down the road where the girl had been. What just happened? He thought, as he slipped the doll into the pocket of his shorts.